As a graduate student in the History Department’s Archives track at the University of Massachusetts Boston, I was required to complete a 120 hour internship at an archival institution to gain practical experience in the Archives field. At first I thought there was nothing I could learn from an internship, because throughout my undergraduate and graduate studies I had been employed in the Archives of the John F. Kennedy Presidential Library and Museum, where I had gained all the practical experience I thought I needed. However, rules were rules, and per the suggestion of my adviser I took on a project at the Kennedy Library that was different from anything I had done in my previous years there. Not only did I end up having fun doing the project, I also learned several new skills that have broadened my archival abilities and helped build on the skills I previously had. The project I worked on for my internship involved digitizing, cataloging, and publishing a manuscript collection to the Web. This project differed greatly from my previous work in the Declassification and Reference departments of the Kennedy Library as I had never before digitized or cataloged a collection; I wasn’t even sure what that meant. 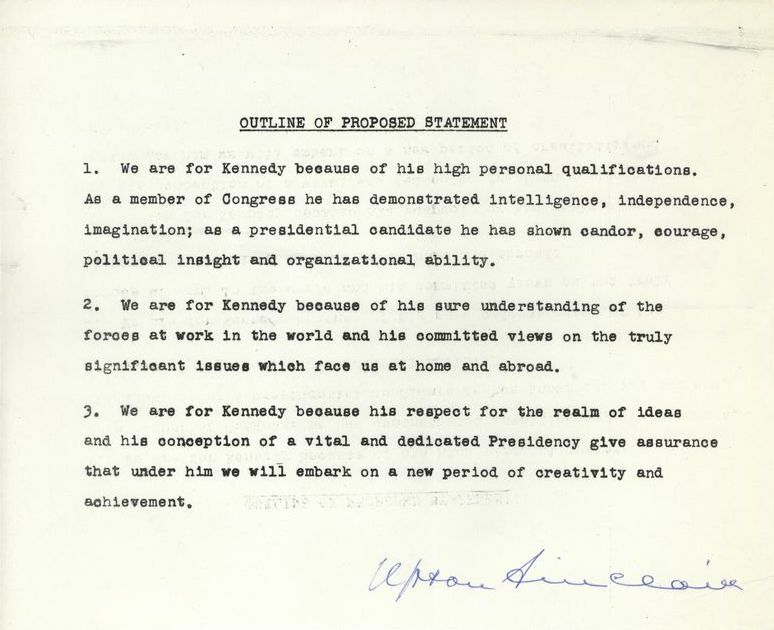 The collection I worked on was the Personal Papers of John L. Saltonstall, the director of the Committee of Arts, Letters, & Sciences for Kennedy for President. JLSPP-001-010-p0002. 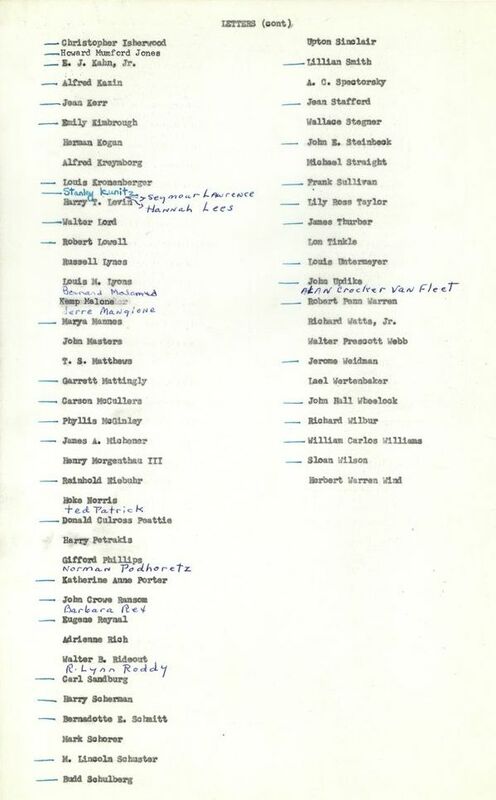 Partial list of Committee members published in newspapers around the country, November 2, 1960. I began my internship by reviewing the collection: making sure everything was in order; was preserved properly; and in adequate condition to be scanned. During this process I learned about John Saltonstall and the Committee of Arts, Letters, & Sciences for Kennedy for President. 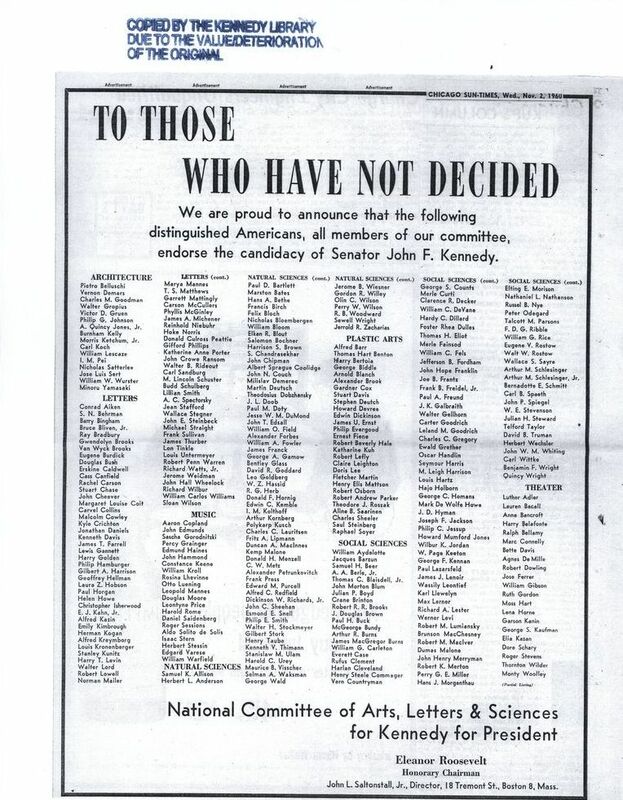 The organization’s mission was to gather support for Senator Kennedy among Democratic liberals; it also sought to convey to the Nation the support that existed among the country’s leading artists, writers, musicians, architects, and scientists for Senator Kennedy’s presidential run. While processing, I also found a few valuable documents, most notably signatures from writers Upton Sinclair and Thornton Wilder. Because of the value of these signatures, I replaced the original documents with photocopies and transferred the originals to a secure area of the archives. The next step in my internship was to digitize and create metadata for all of the materials in the collection, about 750 items in total. I scanned each document to the standards set by NARA and the Kennedy Library. I then reviewed the scanned documents for quality control, making sure the digitized folders matched the original folders, exactly. During this step I also marked down important information about the folders, such as date spans, valuable or important documents, and the general theme of the folder. Next, I began to catalogue and describe the collection; this part of the internship I found most challenging. Using the information I had previously marked down, I inputted the date span of each folder, the number of pages scanned, relevant browsing terms, and the digitization specifications into the metadata software. I also attempted to identify documents that might be of greatest interest to researchers; I then used those documents to describe and highlight the contents of each folder. After editing the descriptions (several times) with input from my supervisor and making sure that all of my metadata was correct, the cataloguing was done! JLSPP-001-015-p0028. 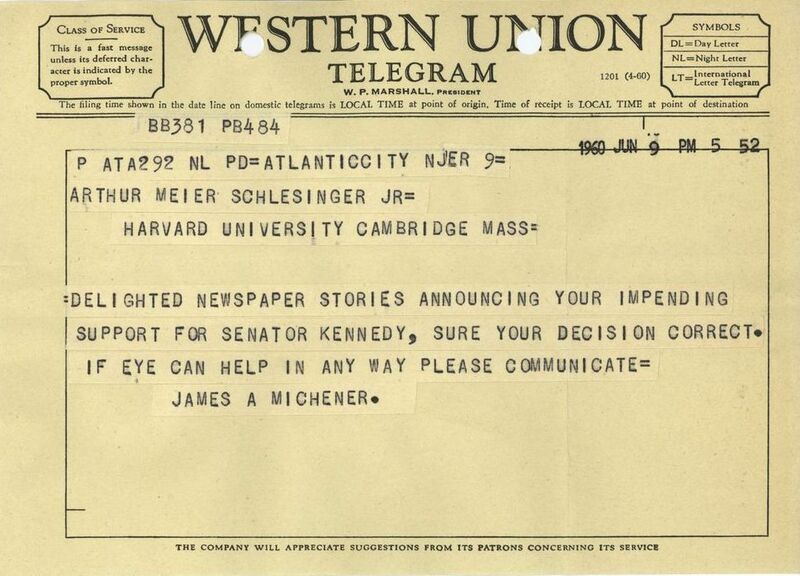 Telegram from James A. Michener to Arthur M. Schlesinger, Jr., June 9, 1960. With digitization and cataloging completed, the collection was then published online; it can now be found on the Library’s website here: finding aid | digitized collection. I had a great time conducting my digitization internship at the John F. Kennedy Library. I was able to work with people I had never worked with before, I acquired new and valuable skills, and I learned a great deal about the 1960 presidential campaign. None of this could have been possible without the help of my supervisors, Erica Boudreau, Jenny Marciello, and especially Kelly Francis, who answered my hundreds of questions with patience, and who was full of encouragement throughout the entire process.